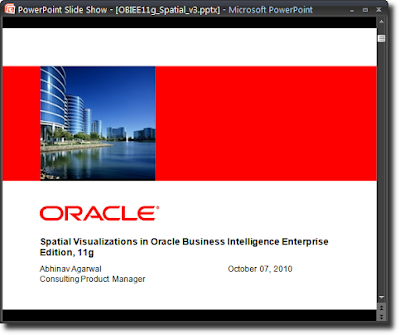 As I posted I did a webcast on spatial visualizations in Oracle BI EE 11g (Spatial Data Visualizations in OBIEE 11g). This eseminar is now available online at eSeminarOracle BI EE 11g - Spatial Visualizations - this may require a login and may not be available free for everyone. I did a webcast last week on spatial data visualizations in Oracle BI EE 11g. 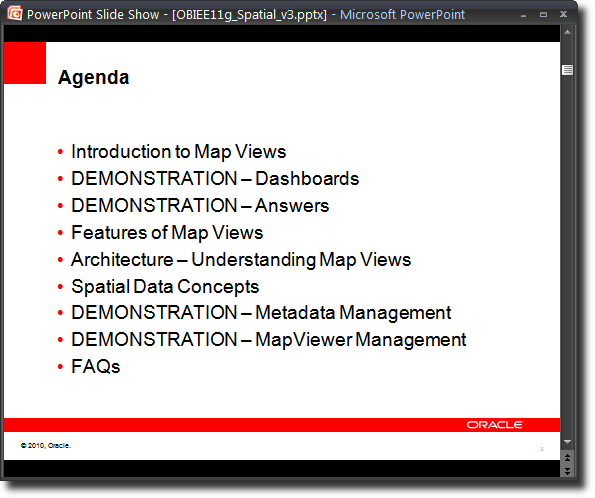 This entire session was focused on mapping in the suite, and while I tried to split the time evenly between the front end and the back end parts of mapping, I realize that talking about and explaining how the magic actually happens requires more than 20 minutes or so. 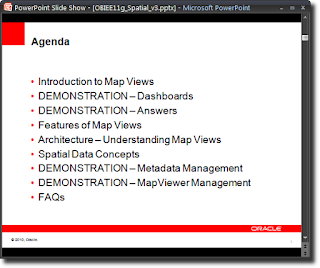 The plan was to do a very quick introduction to maps in 11g, and then dive straight into demonstrations. 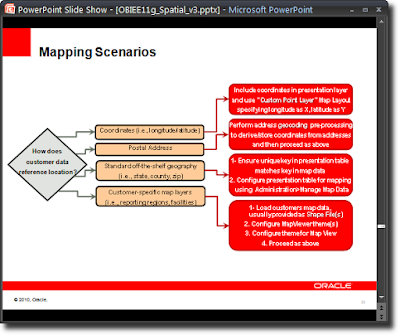 I have followed this path frequently in the last - start off at the top, show the capabilities of the product in the Dashboards interface, as end-users would see it. In most deployments, your dashboarding product is seen by more than 90% of the users. Then move to Answers, the report creation and analysis interface. Often also known as the "power user interface", this is where analysts will often go to to perform deep analysis using the tools at their disposal. Answers is also the product that is used to create the analyses - tables, pivots, graphs, maps, gauges, etc... - that are published to a Dashboard page. 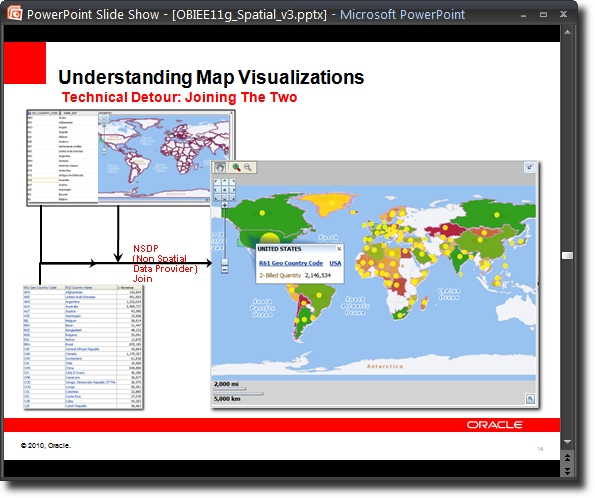 The point of starting out with a Dashboards demo is to show how easy to use the interface in maps is for end-users, and the great number of options available to them, from sliders on color ramps, to drilling, to invoking Actions, to sending master events to listening views, to checking on or off different formats displayed on a map, and more. After this little bit of magic is shown to the user, the focus then shifts to Answers. Here the point is a little different, and yet much the same too. To show how easy it is to create reports with maps. That maps are really just another view in the product suite. A point-and-click interface is what drives the creation of maps. That it is possible to create maps in as little as 15 seconds. Or less. Towards the end of the session, I had this neat little slide that I borrowed from one of David Lapp's excellent presentations, that I think captures very neatly the four main scenarios of mapping in an analytics environment.